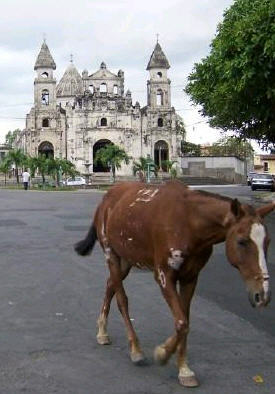 Nicaragua - choice eco-destination in a recession? If you've already done the "easy" central american destinations like Costa Rica and Belize and want to try something a little more adventuresome (and a little cheaper), you may be surprised how far Nicaragua's tourism infranstructure has come in a few short years. Geologically, Nicaragua has similar terrain to its eco-tourism hotshot neighbor Costa Rica. It has stunning volcanos, gorgeous beaches and a rich jungle and cloud forest life. What it lacks is the early start that Costa Rica got in perserving these assets. But it also still lacks the crowds and being a traveller there, feels authentic in a way some other central american destinations do not. Our travels were centered around the colonial town of Granada which is a short taxi ride (get a fixed price at the airport) from the international airport (get a fixed price at the airport) and where the majority of the tourism infrastructure is based. There are all kinds of lodging catering to all tastes and budgets. What we did was make a reservation over the Web for our first night at La Siesta a friendly "backpacker" hostal catering to a youngish crowd working on their spanish - a steal at $25 a night. We moved to a new, very small hotel around the corner which still had no website and for $40 we got a little more privacy and a/c. We found that the majority of the smaller, more intimate small hotels, hostals or hospideja's did not yet have websites of their own - and finding the perfect place when you get there is part of the adventure. Although we have travelled in Costa Rica and Guatamala, we still wanted to get our Volcano fix. Granada has several competing tour offices which provide excursions to the Volcanos closest to Granada including Mombacha and Mayasa. We took a tour to Volcan Mayasa at sunset which included a tour of bat caves. This is an excusion that must be done with a tour, still I was a little concerned with the number of people visiting the caves and its potential impact on the bats and that there seemed to be too many tours. Unlike Costa Rica, Nicaragua hasn't completely figured out how to manage its newly popular natural attractions but they seem to know where they need to head. Another day we skipped the full package tour and got ourselves to the bottom of the dormant volcano Mombacho, a national park since 1983. We walked about a mile to the park entrance where you can get a ride to the top in an open air truck/bus - ours was filled with schoolkids. It was misty and cool at the top where there is a nice, low key visitor center and cafe and where you can hike around the verdant caldera. Make sure you bring a jacket, the temperature was quite cool! Volcanos are just one of the reasons why an eco-minded tourist should consider Nicaragua. I'll elaborate more on a place close to Granada that is truely special and not rivaled in nearby countries I have visited in my next post. On a final note, Nicaragua's tourism must be doing something right because even in the recession, their tourism is growing. In Nicaragua, eco-tourism and budget travel go hand in hand.